It's so exciting to see how many of us are hooked on the hexagons! I've seen some great hexes out there! This weekend, I've been thinking about layouts for my charm quilt. If you saw my first hexagon post, you may remember that I was a skeptic. I didn't plan on actually enjoying making hexagons, I only wanted to see what the fuss was about. So, the first batch of hexagons I made contained a number of duplicates. Those are above. My skepticism is also the reason I started with one inch hexagons. I wanted to waste as little fabric as possible on this experiment. After my hexagon enchantment, I decided I wanted to make a charm quilt; no two fabrics alike. I had already pieced a number of hexagons together, but I chalked those up to practice and decided to start a new batch without duplicates. Some of those are above. If you are doing a true charm quilt, I think there's a decision that will need to be made in the beginning. 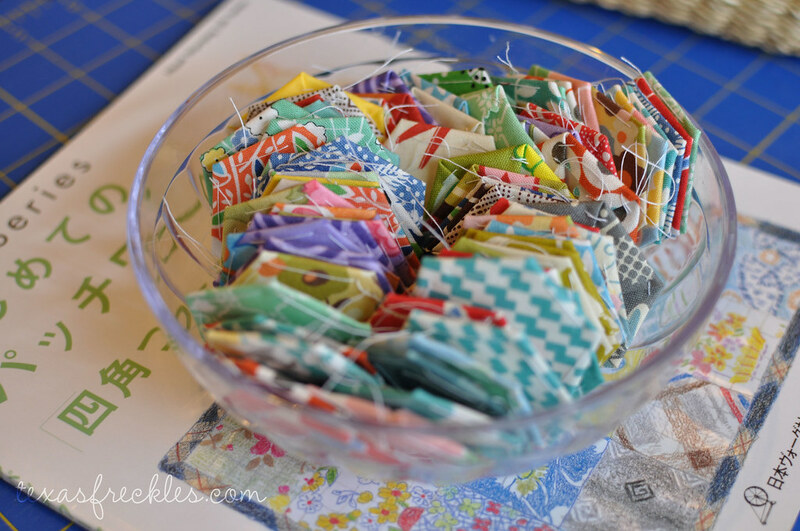 Are you going to sew them together in random order as you make them or create a planned layout, perhaps by color? 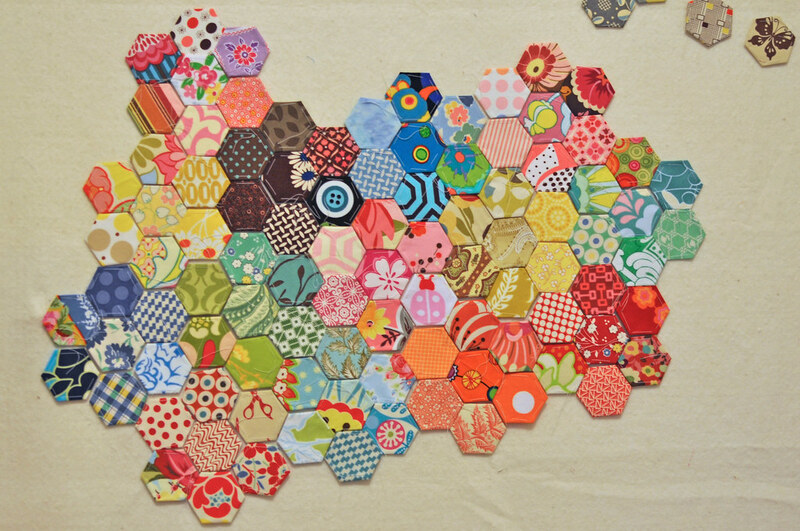 With a sew-as-you-go random layout, (like the one above) you can sew the hexagons together as you create them and that could be a very good thing. In my case, this would make the likelihood of a finished quilt much more of a possibility. Making the hexagons is fun, quick and, addictive. But, sewing them together takes a little longer and requires more focus. I can just imagine myself months from now staring into a shoebox of over 1,100 hexagons and thinking "I have to sew all those together now!?! Ugh!" One drawback of the sew-as-you-go layout might be that you use all the fabrics currently in your stash and they end up in the same part of the quilt rather than being spread throughout the quilt. For instance, all your Moda Wonderland is kind of clumped together. 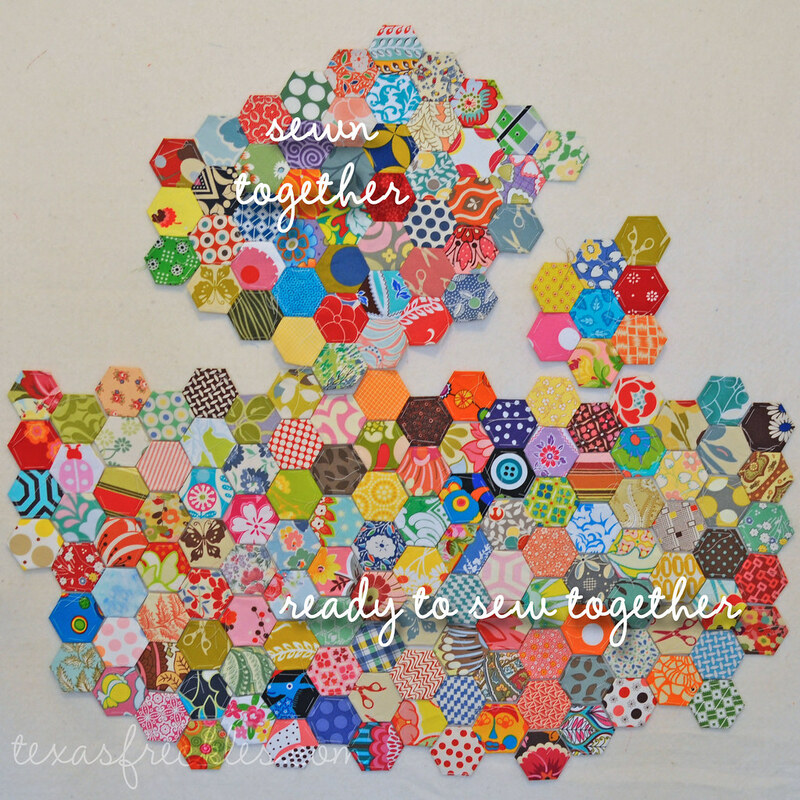 One way to remedy that might be to sew your hexagons together in small-ish sections and wait until you are near the end to sew all the sections together. That way, new fabrics you add months from now can be interspersed with your older fabrics. A more planned layout can be extremely attractive, but requires a little forethought. I was playing with some of my hexagons and I really like the color spectrum layout (above). I find it very visually appealing. But, in order to get a true color spectrum, I think I'd need to make the majority, if not all, of my hexagons prior the sewing them together. That brings me back to the shoebox of 1,100 plus little, loose hexagons. This layout uses a single color sewn into a flower and then placed in a color spectrum. I didn't have enough hexes done to fill this one in more, but it's a nice possibility. I'll call this one the flower spectrum layout. The flowers (seven hexes) could be sewn together as you go leaving you with only sewing the flowers together in the end, but the color flow might not be as nice as laying them all out individually prior to sewing them together. In this layout, I could create flowers of a single color feeling and then sew the flowers together at random. 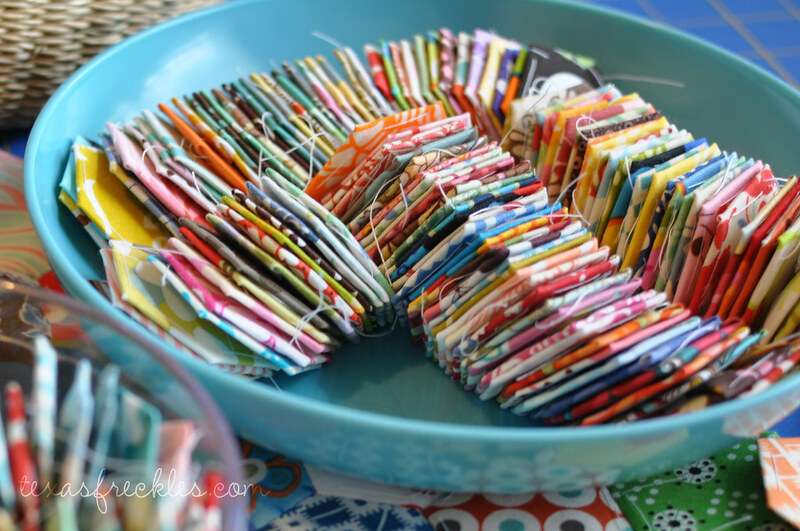 This method could easily be sew-as-you-go and makes me think of organized chaos. It's quickly growing on me. My dilemma? I need to decide! I've made well over 250 one inch hexagons, but only about 180 of those are one-of-a-kind. I've already sewn about 55 of those 180 together and I can't use those in any kind of a planned layout; they are totally random. If you are doing a charm quilt, have you decided what type of layout you are using? I'd love to hear your thoughts and opinions! My favourite is the single colour flowers sewn together at random...I love the idea of organized chaos. And it is also very pleasing to look at! Good luck making a decision. In truth, I don't think you can go wrong with any of the choices. I like the colors spectrum and the flowersway too...hard choice! I love seeing your bowls of tidy little hexes, just waiting to know who their neighbors will be. I've decided I'm all about the colour spectrum layout (I think I mentioned it in my blog post a couple of days ago, along with my general colour wheel addiction at the moment). I've resigned myself to having to sew some insane quantity of hexagons before I can start piecing the quilt top, but I'm OK with that for now. If I get bored, I may change my plan though! i vote for "flower spectrum" or the last one... "organized chaos" .. but whatever way you go.. i think it'll be great! I can see you dilema! They are all beautiful but I think I'm leaning twoards the first colour spectrum one. I would find it more interst to put together I think. Chaos, definitely chaos....organized or not, it is the way to go.....faced with all those bowls and bowls of hexies, would you ever get them done? 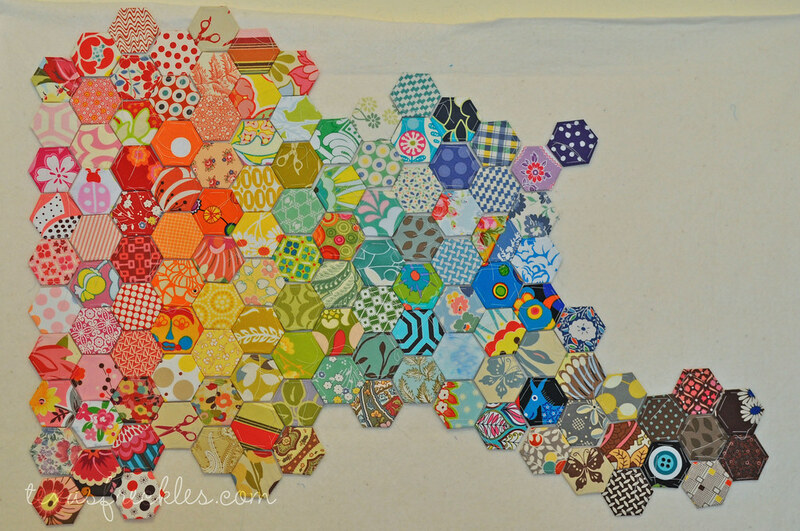 I'm not going to participate in the hexie-bit, but I'm going to start a charm quilt soon because of your inspiration...I'm thinking a Tumbling Blocks, hand-pieced. On another note, I found this mention of Charm quilts interesting. The author Kathleen Tracy in her book Remembering Adelia says, "The saying goes that if you made a quilt from 1000 different scraps, no two alike, your quilt would be "charmed"! So here is my question about the hexes-once you have the quilt top complete with hexes, how will you quilt it? They are so small-will it be a quilt in the ditch project, or a tie quilt perhaps? Do you find the smaller hexes more challenging to make? Also, are all of your hexes quilter's cotton? Have you tried any other types of fabric (voile, for example). If you get around to it, I'd love to hear your thoughts! Oh my god - your pictures are awesome! I love the color spectrum layout - it looks gorgeous! I'd love to start Hexing.... I've been considering it for awhile now.. thanks for offering the giveaway. What a great post! Lots of options. I think it comes down to whet do you think you will finish? Hi Melanie! I am so excited I started preparing hexies and setting side my duplicates for you, :)! I am thinking of the spectrum idea, I would love that look, with the added whimsy of chaos. I think my plan is to prepare hexies for awhile and then start 'from the centre out... Like a journal of randomness, :)! Wow. I've just finished reading your blog. Well, not entirely, at least two years worth. Your posts have been so helpful in getting me through some "hexer's block", shall we say? I've written a "Hexspotting" post on your blog that'll be posted shortly, linking to several of your posts. I'll be following your blog daily! You could do something like one of Red Pepper Quilt's designs with your random start as a border and your color spectrum in the center. That Red Pepper quilt wasn't a hex, it just had 4 patches in different sizes and layout, separated by a few white borders. I love hexes too, and want to post my pics soon on my account. That was before I fell in love with more modern fabrics. Yet, my hex pattern is my own and is kindof a cross. I'm a new member to DMQGuild! Will probably meet you sometime soon! My first quilt was a Grandmother's Flower Garden and it took 5-1/2 years to piece and quilt. 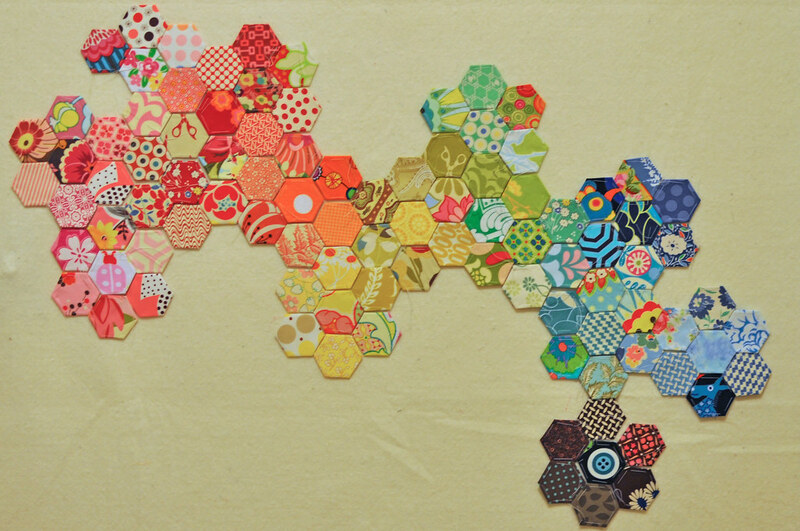 This time around, I had the plan of piecing it so there were no two hexagons alike. After a while I realized that it was impossible. This quilt is made with left-over fabric. I started it in 2010 and am probably half way through. If I am lucky, it will be in the quilt show at Davies Manor in Memphis, TN, next November.